Just outside the doors of your home office, there are baskets of laundry waiting to be folded. The house needs vacuumed and dusted. The lawn needs to be mowed. And you have a deadline to meet. Ugh! Does this sound like you? Nearly everyone struggles to balance work with the rest of life, but for many freelancers it’s hard to know where to draw the line when your life and work when work and life happen in the same place. Real life tasks do bleed over into our freelancing lives. If we don’t get them under control, they can affect our freelancing businesses. In this post, I provide over 13 practical tips to make your real life and ultimately your freelancing life easier. Best of all, these tips are (mostly) low-tech and are fairly easy to do. At the end, I’d like your tips on how to make the freelancing life easier. As you’ve probably figured out, freelancing is a lot of work. Unfortunately, life has its own work. Handling both life and freelancing probably seems impossible sometimes, but you really can do both with these easy tips. Don’t schedule yourself for 40 hours a week. You’ll probably end up working more than 40 hours, but at least this way you have some breathing room if something unexpected occurs. Freelancers who schedule 40 hours a week usually end up working between 50 and 60 hours a week. Don’t answer the phone/door when you work. If being interrupted by phone calls or door-to-door sales people is a problem, just don’t respond. Most door-to-door sales people will give up after a few knocks. You can set the ringer volume on your phone on its lowest setting. Keep regular hours. Unfortunately, one of the most alluring things about freelancing can also be a freelancer’s downfall-the ability to work whenever you want. For most people, setting a regular freelancing routine with regular hours usually improves productivity. Let friends and family help. You may not have to do all the chores yourself. 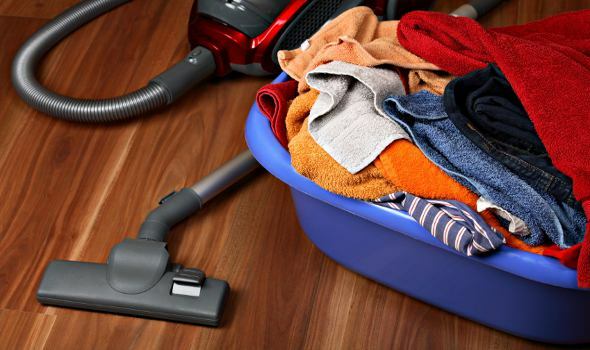 Assign routine tasks such as laundry or vacuuming to your kids. Or work out a schedule for household chores and take turns doing them with your partner. Get hired help. If you were raised to be frugal (as I was), it probably goes against your nature to hire people to do chores for you. However, hiring help for routine tasks such as yard work and housekeeping chores makes sense if your time is worth more than it costs to pay a helper. Buy low maintenance whenever possible. Some finishes just require more work than others. For example, some fabrics require extra cleaning. Real silver needs to be polished. I’m sure you can think of other examples. Buy low maintenance products when you can. Cook two meals at once. Cooking can be a big chore, but it’s expensive to go out or to order food in. And processed foods aren’t good for you anyway. One solution can be to cook an extra meal every time you cook. Eat one meal and freeze the other for later. Get rid of extra stuff. Extra stuff means extra work. Don’t keep stuff around the house unless you really need it. Donate old clothes and toys to a charity. Take old books to the used bookstore. The less you own, the fewer things you need to take care of. Save time on grocery shopping. Grocery shopping can be a time-consuming chore, but there are ways to simplify. First of all, always use a list and take an inventory of what you have. Secondly, shop for several weeks’ worth of groceries at once. Deal with the mail. Open the mail and deal with each piece right away. Pay bills as soon as you get them. Put advertisements and junk mail in the trash as soon as you get them. Put up a few bulletin boards for anything that you can’t deal with immediately. Put big non-work tasks on your calendar. Filling out your taxes is an example of a large task that takes a lot of time (if you do your own taxes). One way to make sure that you have enough time for larger tasks is to include them on your schedule. Give your keys (and other small objects) a permanent home. Do you ever struggle to find your keys when it’s time to go? You can spend a lot of time trying to figure out where you left them. Or you can get in the habit of putting them in the same place every time you come home. Stop comparing yourself to others. Keeping up with “Joneses” is not only expensive, it can be time-consuming and stressful. Besides, the “Joneses” may look like they have a wonderful life, but appearances can be deceiving. Who knows what it’s really like for them? Bonus tip: Keep up with routine maintenance for big-ticket items. There’s a reason why routine maintenance tasks, such as changing the oil in your car, are needed. If you skip them or put them off you could wind up needing costly (and time-consuming) repairs. As you can see, household chores can take up a lot of time–time that you need for your freelancing business. By following the tips above, you can manage both your work and your life. What are your secrets for balancing freelancing and life tasks?